We wish there was a way to guarantee that every precious piece entrusted to the US Postal Service would arrive to its lucky recipient in pristine condition with nary a scratch or a wrinkle. Until the mail fairy reveals herself (and we promise to let you know when that happens! ), we’ve got a few tips to help you do the best job yourself. Before buying your postage, take a field trip to your local post office with one complete set of your Regas invitations in hand. A USPS representative will weigh the set and provide the exact amount needed for the outer envelope. Keep in mind that extra large or square shapes and extra-thick paper can add to the cost. Thick luxe papers can incur an extra fee called a “rigid charge” so be sure to ask if it applies. If you have any international guests, ask what the total will be for each far-off destination. And don’t forget to buy postage for your reply envelopes! Finally, confirm that the branch you’ve visited provides the service of hand canceling, which helps the outer envelopes (and sometimes the inner contents too!) retain a cleaner look as they go through the mail. 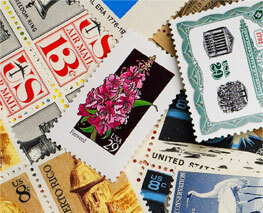 Stamp the outer and reply envelopes with your newly acquired postage. Remember that international guests should receive a blank reply envelope, as these guests will need to put their own countries’ postage on when mailing back the card. After all your invitations have been lovingly assembled, pack them carefully in a shopping bag or canvas tote to take to the post office. Once your turn at the counter has come, provide the total number of invitations and request hand canceling. Here is where you turn on the charm: bat your eyes, crack a joke, compliment the representative’s nails- we know you can do it! This is the crucial point of drop off and the employee receiving your invitations could determine if they are in fact hand canceled as you are requesting. There is a slight charge for this service-the first 50 are free, with each additional invitation costing 5 cents. Give yourself a big pat on the back, and get ready: before you know it the fun replies will be pouring in from your excited guests!